Click on the video above to watch Kitty Calhoun explain and demonstrate the rest step while carrying a heavy Indian Creek climbing backpack. Use the Rest Step to conserve energy when hiking in the mountains and approaching rock climbs. You can also use the Rest Step while backcountry skiing. 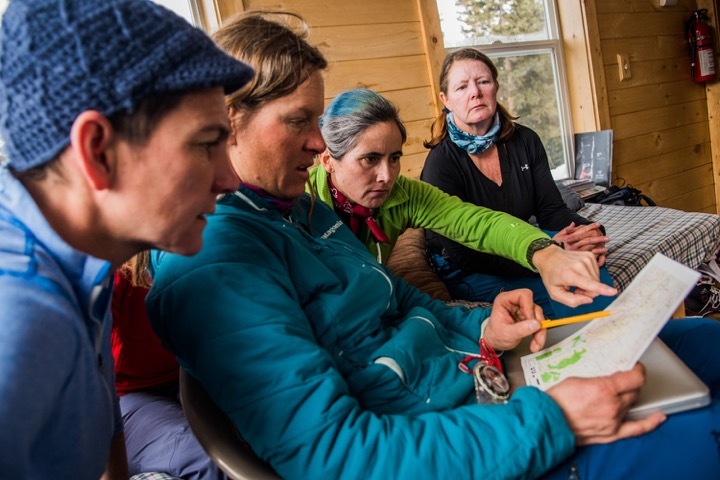 Learn more about climbing and skiing from Kitty on a number of different Chicks Programs. 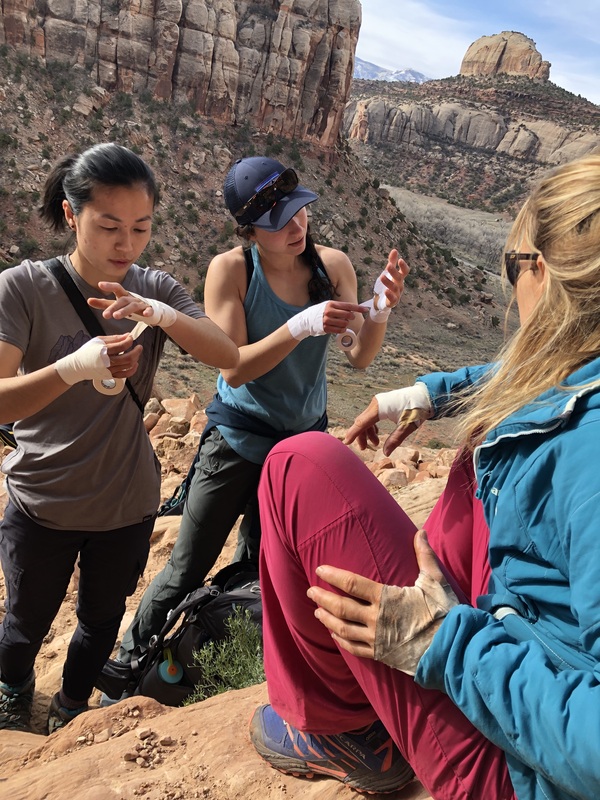 Kitty teaching Spring 2019 Chicks Indian Creek participants how to tape up before climbing. When I first began doing winter alpine ascents, almost 40 years ago, what I feared most was getting benighted. 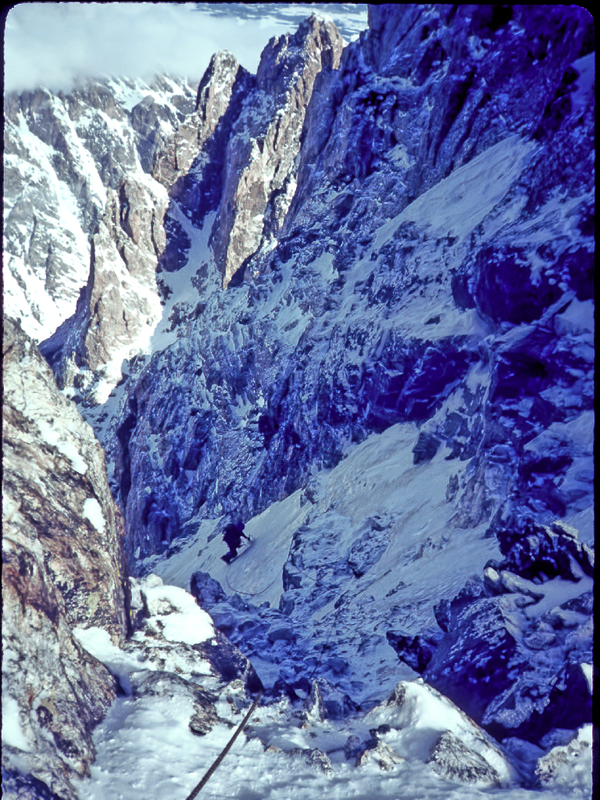 Yet, as these things go, in January 1984 I found myself near the top of the West Face of the Grand Teton, in the dark. There I sat, bumping my head against my partner, Bobby Knight. The head bumping was my way of forcing us to stay awake to keep wiggling our toes. I was terrified that if we dozed off our feet would freeze. It turns out we were off-route. Bobby and I were supposed to be on the Black Ice Couloir. But, instead we were in a nearby dihedral. The dihedral had suckered us with endless, blissful mixed climbing. However, hours of joyful climbing soon turned to concern, as it grew dark. Using night vision and our weak, circa 1984 headlamp, we were able to keep climbing. But when the dihedral ended at the base of a dark, blank-looking face we were stuck. There was nothing to do but sit on a ledge, bump heads and wait for daylight. It’s a good thing I have a hard head! Eventually morning came, finding us sleepy but unfrozen. In the daylight we traversed out right onto the Black Ice Couloir and continued to the summit. Looking back, I’m certain that if we’d had a modern, Black Diamond Icon Headlamp with 125 feet of 500 lumens we could have kept going and avoided that frightening unplanned bivouac. Save room on your gear loops with the waterfall method. 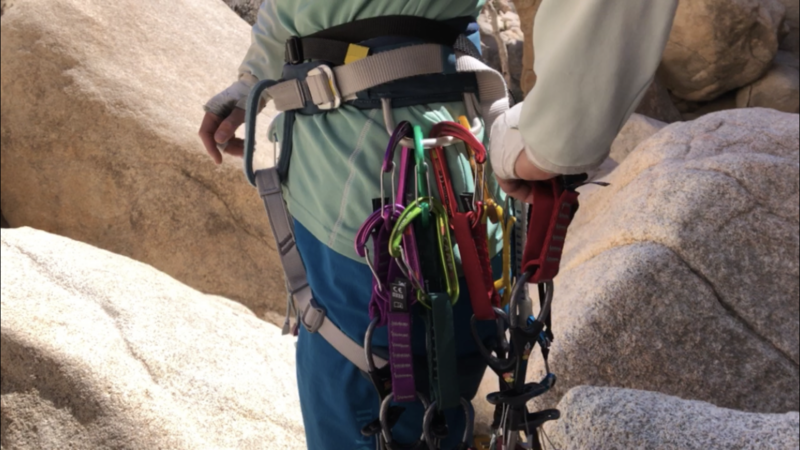 If you like to rack up on your harness like me, you’ll find that you quickly run out of gear-loop space if you’re carrying multiple sets. The waterfall racking method saves a ton of room and helps you keep organized. First, clip a cam to your gear loop as usual. Then, clip a second cam to the racking carabiner of the first one. You can see that I’ve already doubled up the purples and greens. And then I’m clipping the second red cam to the red carabineer of the first red cam. The waterfall method will help you save room on your gear loops. It will also help you keep better track of how many of each size you’ve already placed. The last thing you want to think about when you’re off the deck is the viability of your equipment. The beginning of every season marks an important time to check your Personal Protective Equipment (PPE). Just as we pump up our push-ups and finger board workouts, preparing for the rock season ahead, so too should we insure our equipment is in good nick. Rock PPE or climbing protection protects us while climbing. The life span of some climbing protection is easy to evaluate. With others it’s more challenging. 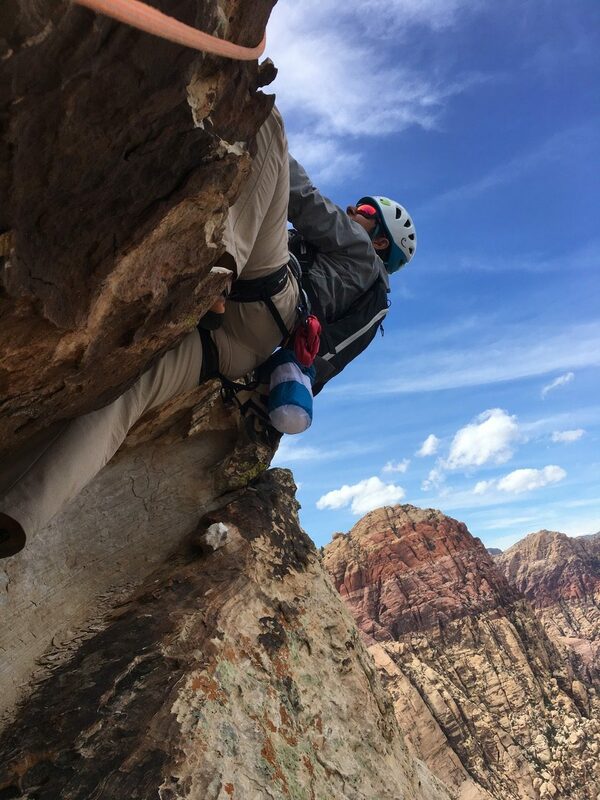 Climbing gear manufacturer, PETZL, breaks Rock PPE into three categories. Gear in category 1 is easy to inspect. It adds to our safety system, but it isn’t critical. I include belay glasses here because they help reduce strain in my neck and back particularly when I’m sport climbing. Retire Helmets after 10 years of minimal use and after 3-5 years of frequent use. Sign of UV fatigue, cracks, strap-wear or damage to the foam casing inside the shell means a helmet should be replaced. Fall protection is a critical category and gear in this category is the hardest to inspect. Critical climbing gear includes harnesses, ropes, webbing, slings, PAS, carabiners, belay devices, nuts, cams, ascenders, etc. Harnesses should be retired immediately if they show any wear, fraying or damage to the belay loops or waist belt. Retire a harness after 7 years; or, retire your harness every year if you’re a regular user. Slings, cord and webbing should be retired after 10 years even if never used. Anything with excessive wear should be retired immediately. I retire my skinny cords like prusiks and cordelettes every year or two. Their smaller diameter means they wear faster. And, I use them a lot! For ropes, read my previous article, Rules For Rope Care and Longevity. Hardware like carabiners, nuts and cams are easier to inspect. Look for grooves and any signs of hairline cracks. Look especially closely for hairline cracks at the gate/pin area of your carabiners. You can replace frayed cam wires yourself. Frayed nut wires, however, means you need new nuts! An unattended wire may not be a safety issue initially. But frayed wires will dig into your soft gear, clothing and skin, creating all kinds of problems. Finally, know your equipment’s history and if in doubt, retire it. 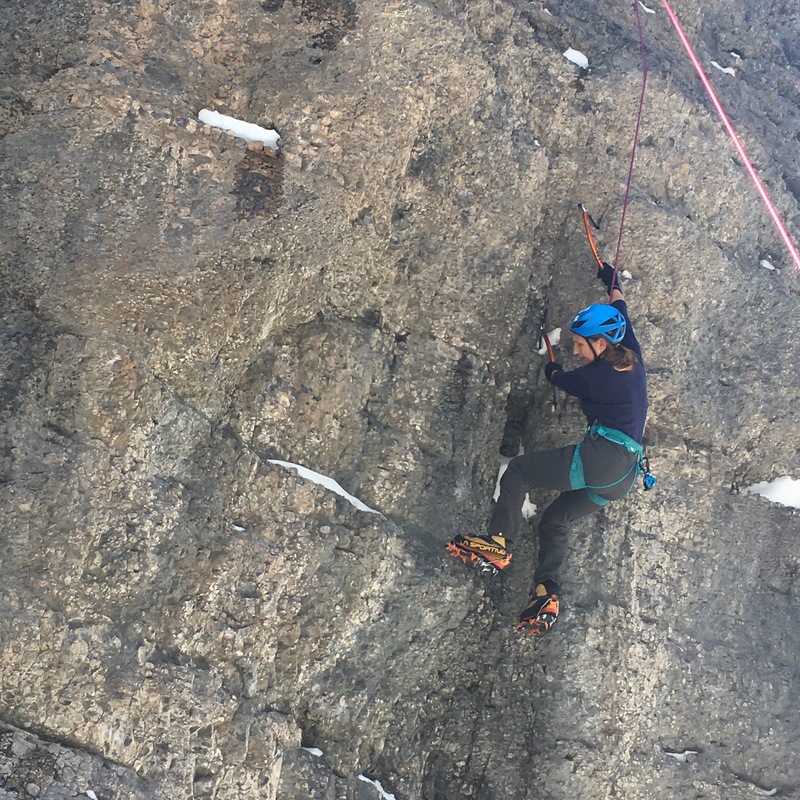 Chicks’ home venue is the Ouray Ice Park—the best place to learn ice climbing from beginners to experts alike, hands down. The Uncompahgre Gorge narrows down to the tight Box Canyon, which transforms into a beautiful Mecca of icy walls begging to be climbed. In the Ice Park, one of the first things we teach is how to belay safely for top rope ice climbing. Ice climbers swing and kick at the ice to get purchase. Consequently, we need to consider the high likelihood that chunks of ice will break off and fall down right below the climber. This area (anywhere the ice chunks might fall) is called the impact zone—and it’s a place to be avoided! 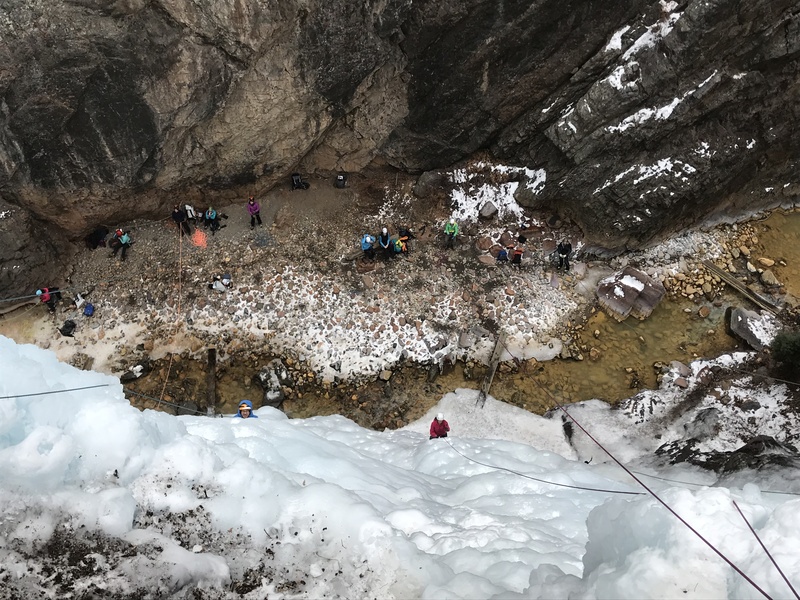 In order to avoid the impact zone it’s best to belay from a short distance away—in the clear from falling ice. However, belaying a horizontal distance away from the base of the climb creates another problem. When your climber loads the rope (either because they fall or they are lowering), you will feel a strong pull towards the base of the climb. This horizontal pull is a big deal! The pull you feel is directed right along the rope. The pull is upward towards the anchor at an angle. This angle, or force vector, has both an upward pull and a horizontal pull. The upward pull is easy to resist. Simply resist it with your body weight by sitting back into your harness. The horizontal pull, however, is much harder to resist. It can drag you along the ground and slam you into the wall. You could lose control of the rope and possibly drop your climber. The solution to this big deal is a back anchor. Clipping into a back anchor will hold you against any horizontal pull towards the wall. You can use trees or established bolts for back anchors. In the Ice Park there are often fixed ropes that extend the back anchors, elsewhere we bring our own ropes. If you are using a tree, make sure the tree is strong and big. Tie a chunk of rope around the base. Then tie a bight knot into the rope. If you are using a bolt, clip a bight of rope (or other anchor material) to the bolt. Then tie a bight knot into the other end of the rope. Using a locking carabiner, clip the bight you created on either your tree anchor or bolt anchor to your belay loop. Clip it underneath and out of the way of your belay set up/device. Make sure your back-anchor extends just far enough to let you stand comfortably with the rope snug. This allows for no surprises if the climbing rope suddenly gets loaded by your climber. Back anchors are extremely important when you’re in an area like the Ouray Ice Park’s Schoolroom. There are often many climbers on side-by-side top ropes. Lots of ice chunks go flying through the air. Belayers need to be a large horizontal distance away from the ice in order to belay safely. This puts them on the far side of the river. Getting pulled into the river is a sure way to end your climbing day, cold, wet and possibly much worse. Early winter is a great time for Chicks Skiing avalanche training. Brush up on your avalanche rescue skills, refresh your avalanche understanding and get busy reading your local avalanche forecast. Following are two great resources to get you thinking about snow safety. Especially during the holiday travel season, you might find yourself at a new ski area or in new backcountry terrain. This first video, An Introduction to the North American Avalanche Danger Scale, explains the North American Danger Scale and is produced by the National Avalanche Center. Every forecast center in the US and Canada uses the North American Danger Scale to rate the avalanche hazard for the day. It’s important that you are familiar with this messaging tool. Understanding the North American Danger Scale will help you understand the avalanche forecast anywhere you might go in the mountains this winter. Ski Safely Ladies and I’ll see you on the slopes. So Smooth, Just Like Butter on a Muffin! My seven-year-old son, dressed in a Hawaiian shirt with hair slicked back, glided across the room as if he was riding a surfboard. He sang out, “So smooth, just like butter on a muffin.” This line soon became the mantra at my mixed and ice climbing clinics. So, how do you move fluidly? How do you climb so smooth, just like butter on a muffin? You learn to climb in balance with precision and purpose. Join us for our Mixed Climbing Clinic where we’ll take deep dive into understanding climbing in balance with precision and purpose. In the meantime, keep reading to get an idea. Mixed climbing is an aspect of climbing that especially demands precision because the holds tend to be smaller. However, smaller does not necessarily mean harder. If you’re in balance, then smaller holds can be more useful than larger holds that put you out of balance. My Pilates instructor once told me, “Use stability to provide mobility.” It is the same in mixed climbing. You must learn to keep your core and all of your limbs perfectly still. This all-body-stillness supports the stability and balance you’ll need to move your next tool or foot up. Then the trick is to shift your balance and stabilize under your newly placed tool or over your newly placed foot. Watch a graceful climber and you’ll notice that she’ll slow down and study the next sequence of moves from a relative rest position. Then, once she begins to move again, she’ll commit without hesitation to each move. It’s as if she has glue on her front points and picks. She does not stop and “shop around” for holds. Visualizing in small detail is as effective in terms of building brain engrams as doing the actual movement itself. Yet visualization takes discipline. It takes practice to slow down and focus on running a play-by-play movie in your mind of you climbing like a super star. Breath connects mind to body. Use your breath as a tool to keep yourself calm and performing efficiently. Start by simply reminding yourself to breathe. It is very common to hold your breath when the going gets tough. Then you can work your way into more specific techniques. Try inhaling slowly and deeply through your nose combined with a pursed-lip out-breath. Soon, you too, will be climbing as smooth as butter on a muffin! Did you know that 32-41°F is the best sending temperature? Hands and fingers get the best friction near freezing because they don’t sweat; and, climbing shoe rubber is designed to perform best at these temperatures too. Autumn temperatures can send chills down your spine and make your hands go numb if you’re not ready. Follow my tips to get psyched and stay toasty during fall sending season. Take warm/hot drinks. Bring a thermos and/or start with hot water in a regular bottle. Drink the liquid while it’s still warm. Staying hydrated helps keep your strength and body temperature up. You may not think to drink if you’re not sweating and if you’re cold, a cold drink is unappealing. Get a thermos. Bring plenty of easily digestible snacks, such as GU Stroop waffles. You need calories to climb well and to stay warm. Take clothes off while exerting; add clothes when not: hat, down/puffy jacket, windbreaker, socks with the feet cut out to cover your lower leg and belay gloves are a few essentials. 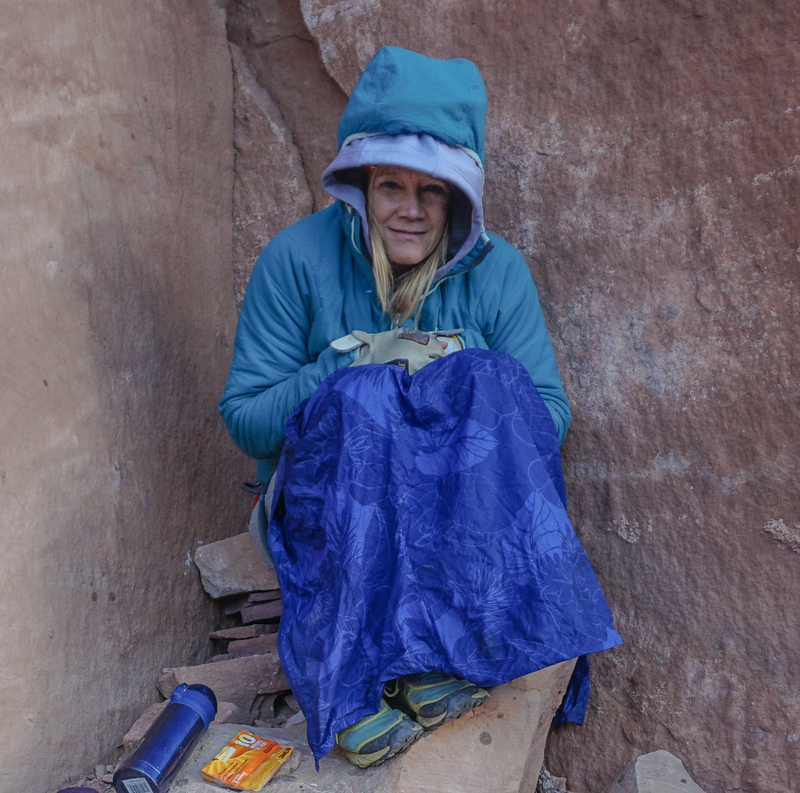 Put a hand warmer in your chalk bag, or your sports bra. Stretch and do air squats before you leave the ground. Cold muscles are stiff and more susceptible to injury. Climb a handful of moderate routes before climbing more difficult routes. Now, what are you waiting for? Get ready and get out and have some fun! Rocktober is upon us. No doubt our ropes have gotten use and withstood abuse with spring, summer and early autumn climbs. Soon we’ll be monitoring backcountry drips for ice and our rope will get a bit of a rest while we sharpen our tools in anticipation of winter. Take stock of this time to inspect, wash, store and retire your rope properly. Your rope is your lifeline. Give it undivided attention and love before you put it away for a while. Giving your rope undivided attention and love will increase your intimacy with it. You’ll get peace of mind knowing that it’s still a performer. And you’ll catch any problems that could reduce its longevity. Run the entire length of your rope through both hands two to three times. Run the rope through your hands without gloves so you have sensitivity to any irregularities in the sheath. Fuzzy sheaths, picks, flat or unusually stiff sections merit closer inspection. If you find one of these, look at it more closely. Compare it to other sections of the rope. Although you can’t see the rope’s core, you can feel it. Roll any sections of concern between your thumb and fingers and back and forth between your hands, paying close attention to how it behaves with bends, knots and twists. Anytime the core of the rope is exposed at all, it is compromised. Cut it shorter to remove this section or retire it. If your hands are black afterwards, this should reinforce that a good wash is in order. Ropes like to be clean but they don’t like harsh detergents. Use a mild detergent or better yet Sterling Wicked Good Rope Wash. I use a large rubbermaid tub or my bathtub. Fill with just enough warm water to ensure the rope is submerged. Add the Wicked Good Rope Washor a small amount of detergent (1 tablespoon). Swish it around and then pile your rope in there (flaked rather than coiled) so it’s all submerged. Let it sit for 30 minutes to absorb the soapy water and dislodge dirt. Get your hands in there and move the rope around, agitating the water like a gentle cycle on your washer. This will dislodge remaining dirt. Remove the rope, dump out the water and replace it with clean, cold or warm water. Put the rope back in and give it another gentle cycle and repeat the process until the water is clear. You can use a top loading washing machine on a gentle cycle, but I prefer to do it manually. Some folks like to daisy chain the entire length of their rope, but I prefer having it in a pile. Dry your rope out of direct sunlight. I hang mine over my pull-up bar or a door. You could use a laundry drying rack or flake it out on the floor. Be sure your rope is fully dry before you store it. I store my ropes stacked in a rope bag. Although there is nothing wrong with coiling and hanging or stowing them away, flaking ropes prevents kinks and divits that come from tight coils. Most rope bags have a ground tarp incorporated. If not, get one and use it. 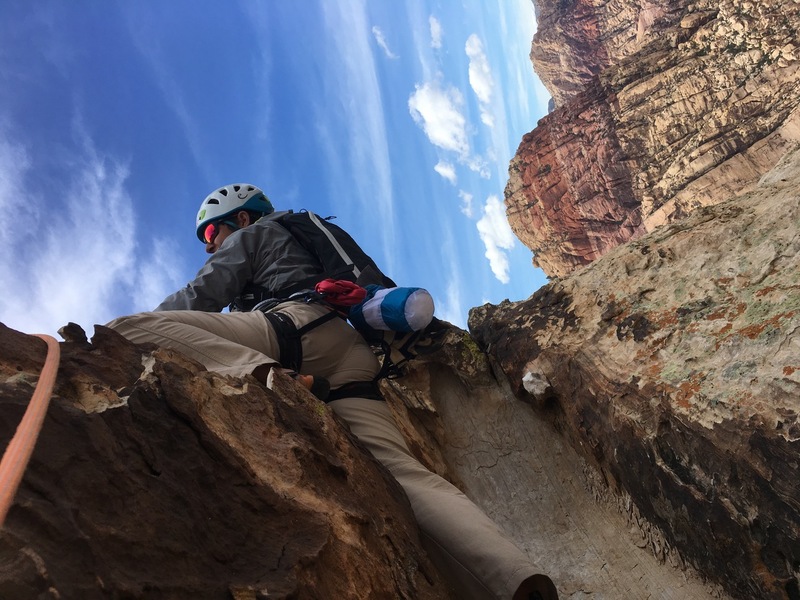 A ground tarp at the crag will add considerably to the longevity of your rope by preventing small, sharp crystals of sand and dirt from penetrating it’s sheath. Rope Bags also give you a grab-and-go system for the next time you head to the crag, or you can easily coil it from a rope bag if you’re packing it for a project. Store your rope in a cool, dry place free from direct sunlight and any chemicals. Acid to ropes is like kryptonite to Superman. Keep them well away. Well cared for ropes last many years. There is no hard and fast rule for how long ropes last because there are so many variables: How much do you climb with it? How many significant lead falls has it sustained? Did it cut the mustard of your rigorous inspection? Here are some general guidelines for rope longevity: If you’re climbing 3-5 days a week, working routes and whipping regularly, your rope may only last a year or less. If you’re a weekend warrior, your lead rope could give you several years. If you climb less frequently you could get four to seven years out of your cord. Much more than 7 years and it will, like all nylon, lose some of it’s dynamic and desirable properties. Ropes, like us, can have several life stages if they’re not compromised. My ropes start as lead ropes. Then my skinny ones go to my neighbor for his rafting trips and my fatter ones retire into the good life of topropes for 3-5 years. All of my ropes are inspected regularly and retired liberally. When they reach the end of their lifespan I either send them to Sterling Rope to recycle or give them to friends for art projects, rigging or doormats. Give your rope the attention it deserves regularly and it’ll serve you well! 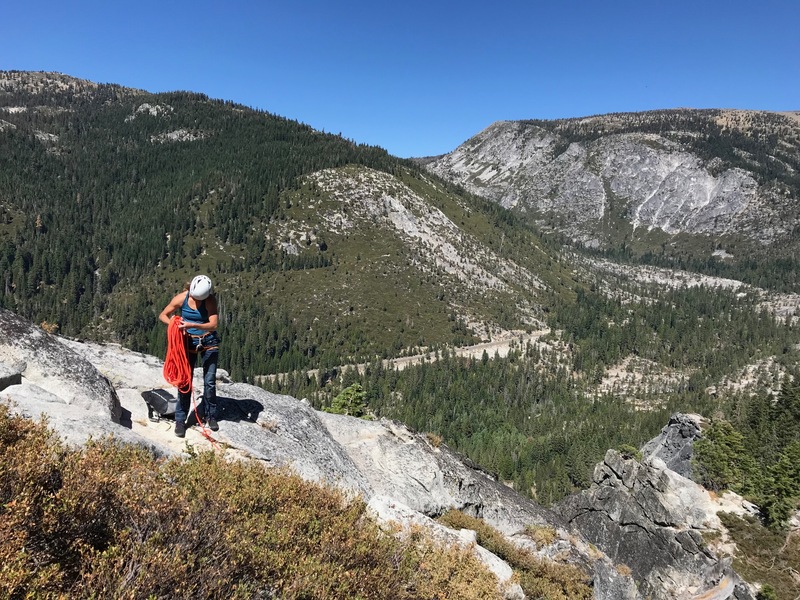 I just returned from teaching two back-to-back clinics at Rifle and Maple Canyon where the primary objective for our participants was either learning to lead or becoming a more confident lead climber on sport routes. And did they ever. At the Maple clinic, Tracy Martin and I, the two instructors for the program, didn’t lead a single route all weekend; the participants did all the rope gunning. They chose the routes, they hung draws, they cleaned the anchors when finished and moved on to the next climb. It was so gratifying to see everyone taking charge of the situation. Clipping bolts can seem pretty basic, you just clip and go. However, there are a couple of pitfalls you need to be aware of that will need fixing on the fly. Let’s talk about the most common mistake and how to fix it quickly, the back-clip. Why does it matter if you’re back clipped or not? There are a couple of different methods to remedy this type of mistake, so let’s look at a few ways. The general rule of thumb is to add before you subtract for optimal security. Clip the second quickdraw behind the first and then remove the offending quickdraw that is back clipped. By adding the second one behind, you stay clipped in at all times and no slack is created. This is the best method if the clip is at a hard section of the climb or anytime you’re not feeling confident. Unclip the top carabiner that is clipped to the bolt hanger and rotate that carabiner in the proper direction and reattach it to the bolt hanger. You need to use your eyes and pay attention to which way to rotate the carabiner. With this method, the rope stays clipped into the bottom carabiner of the draw and you don’t end up dropping any slack down to your belayer. This a good method if you have a very secure stance and the climbing isn’t challenging for you. Unclip the rope and reclip it correctly. I used to do it this way myself until I learned better. This is the LEAST preferred method, but for some reason, it’s the one you probably see most commonly at the crag. The reason I don’t recommend this method is that you are the least secure for the longest period of time. 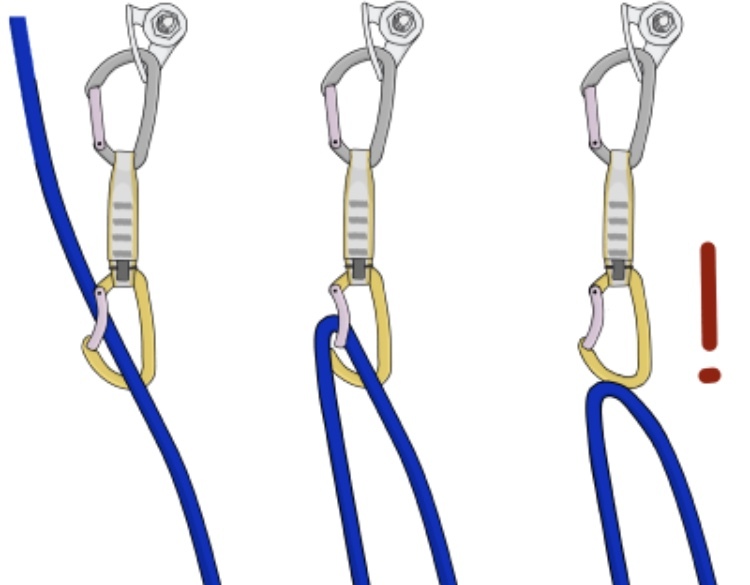 Undoubtedly you’ve already back clipped, then you fight to unclip the rope from the bottom carabiner, your belayer quickly takes in that slack to keep you from taking a bigger fall then necessary, then you have to ask for slack again, possibly getting short-roped by your belayer, FINALLY you reclip. Sigh of relief. Sounds stressful right? That’s because it is, for both you and your belayer. Use method 1 or 2 and you’ll feel much more confident on the sharp end. Keep up to date with upcoming climbing events, promotions and great deals from our partners. © 2015 ChicksClimbing.com • All Rights Reserved | Website by SOF, Inc.